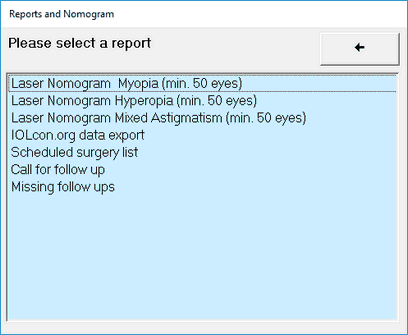 Button number 4 on the main screen brings you to our Laser nomograms, a formatted data export for optimization of IOL constants or to reports of missing follow-up's and a list of scheduled treatments. Nomograms in Datagraph-med are based on a multi-parametric regression analysis and generate a set of 10 coefficients, based on your existing pre- and postoperative data. It includes a cylinder cross coupling term, taking into account the effect of cylinder ablations on the spherical outcome. This algorithm requires a sufficient amount of data points in order to produce meaningful data. A minimum number of 50 eyes with complete pre and postOP data is required before the calculation process starts. Important! Disclaimer of Liability: Due to the complexity of data entry, analysis steps and software programming, we can not guarantee for a proper function or our Nomogram tools. 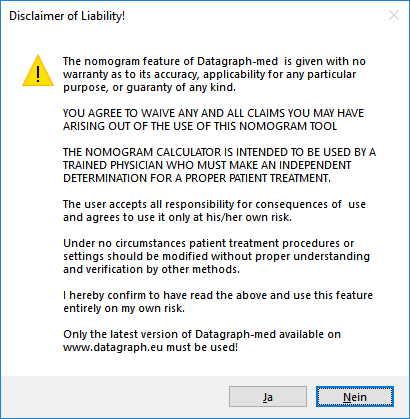 As a user you have to be aware of the possibility of software or programming errors and accept to use Datagraph-med and its nomogram features entirely on your own responsibility. No claims shall be made against Ingenieurbüro Pieger GmbH, its employees, programmers or distributors, especially but not only when it comes to patient claims because of bad outcomes. Consult your laser manufacturer whenever you find larger deviations from your target outcome and / or nomogram adjustments exceed the usual range of 0.25-0.50 D. This may be an indication for technical problems requiring maintenance. Depending on the selected data a second warning will appear, followed by a table, showing the current data. This warning appears whenever the selected data set contains eyes, which have more than ±2 D of difference between laser settings and achieved changed of refraction, because a difference of ±2 D or more seems unlikely and may be due to typing errors or other reasons. The 'Show Data' table contains a number several columns, which can be sorted by clicking on the individual column heads. Clicking on [Err.SEQ], for example, will sort the list according to the largest (or smallest) deviation of laser settings SEQ from the achieved refraction spherical equivalent. This table is meant to be used to identify outliers. A double click on the individual treatment # (first column) will open the patient in it's data entry from, where corrections can be made if needed. All outliers of SEQ, SPH or CYL should be checked here and fixed or excluded before proceeding with the nomogram generation. We recommend to sequentially sort by the following columns and check for extreme values, as they might have a negative influence on the the accuracy of the regression analysis. 1.) |Err.SEQ| - this column shows cases with the largest deviation between Laser Setting and achieved SEQ on top of the list when sorted. The deviation is given as absolute value. 2.) Err.Sph - this column shows cases with the largest deviation between Laser Setting SPH and achieved spherical correction. It can be positive or negative and you must sort in both ways to find all outliers. 3.) Err.Cyl - this column shows cases with the largest deviation between Laser Setting CYL and achieved cylindrical correction. It can be positive or negative and you must sort in both ways to find all outliers. laserRTy - the refraction type category, calculated from the entered laser settings. Differentiation between Nomograms for Myopia, Hyperopia or Mixed Astigmatism are based on the laser settings refraction type category! userRTy - the refraction type category as entered by the user. Generally laserRTy and userRTy should match. If you find unexpected refraction groups in the Data Filter Settings window, there may be a false user classification of the refraction type category OR a data entry error in the laser settings fields. Both should be fixed before proceeding to nomogram generation. Note: It is extremely important to understand that values, entered under Laser Settings on the Laser-Refractive tab, have a direct impact on the generated nomograms. Therefore the user enter data correctly and in a consistent way. For more details see: About Laser Settings.